Caroline Cross steps back in time with the world famous Crystal Palace park dinosaurs. Fundraising efforts have paid off for a south east London charity who has campaigned to build a bridge to connect visitors of Crystal Palace Park to the 167 year old resident dinosaurs. 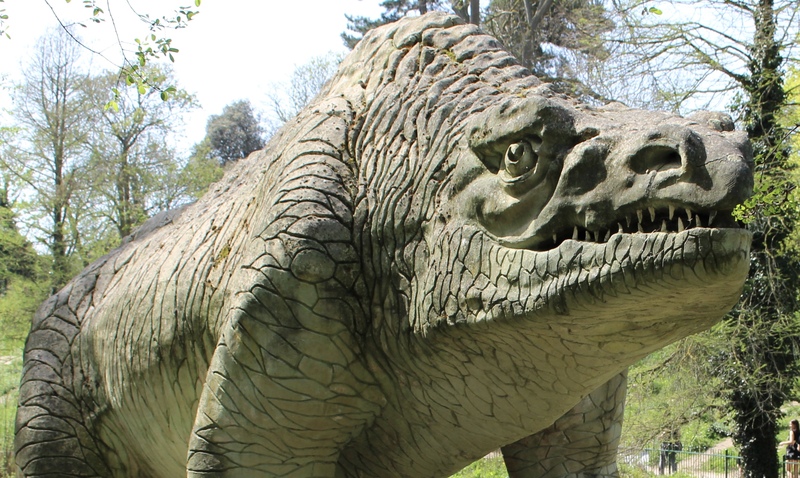 Friends of Crystal Palace Dinosaurs (FCPD) has been on a mission to ensure the Grade 1 listed prehistoric creatures are conserved for future generations. Created in 1852 by wildlife artist Benjamin Waterhouse Hawkins, the dinosaurs were unveiled in 1854 and have been visited by hundreds of people over the years. When first built, they were deemed scientifically educational even though Richard Owen, co-founder of the National History museum, said that they were not anatomically correct. The statues are located on their own island in the park and there has been no access to them for a while. Benjamin Waterhouse Hawkins’ studio in Sydenham, where he made the Crystal Palace Dinosaurs. Wikipedia Image. Late 2018, the charity launched a crowdfunding campaign to raise funds for a new bridge. This raised an enormous donation of £70,000 with over 600 pledges, a very successful outcome. Sarah Slaughter, a Trustee of FCPD told us that a bridge had always been a feature of the site but had to be removed a few years back when works were undertaken on the weir. Although some may remember the original bridge, plenty of people and especially newcomers to the area are excited by the new addition, due to be installed in June 2019. News of the campaign reached local press but took an unexpected turn when the campaign received rock-star support. Sarah said: “Our lucky break came when I asked Slash from Guns N’Roses to help us spread the word on his Twitter account. I knew he had mentioned the dinosaurs in an interview with Dermot O’Leary back in 2014, so I thought it was worth giving it a shot. Fortunately, Slash said yes!” This led to Slash posting to his 3.6million followers which caught the attention of national press (click here to watch the BBC video). Needless to say, these fantastic efforts significantly enhanced the visibility of the campaign. When I asked Sarah whether they had hit any surprises along the way she told us that there was an anonymous contribution of £3333 which boosted funds and helped them to meet their target. My initial reaction was to ask whether this donation was from Slash himself, but Sarah assured me that he had made his own personal contribution to the cause, a hat! Even local Sydenham artist Nick Richards who is January’s #SpotlightOn artist offered a piece of work. When the bridge is open, the charity will be running free tours on to the island for members of the public, schools and other groups. “We expect to run tours from the summer for around 1,200 people per year, helping to build a new love of the Dinos,” asserts Sarah. The dinos are already loved by many, however, for the chance to get up close with these prehistoric reptiles, we will certainly be dinoSAURING over the bridge (sorry for the bad pun!). To find out more about the #dinobridge and to support ‘Friends of Crystal Palace Dinosaurs’ click here.